The LaCie 1TB Rugged USB 3.0 Type-C Portable Hard Drive provides 1TB of space for storing your data. After plug it to your computer, the drive need to be set up first ( LaCie software included). Easy to operate. Easy to operate. With speeds up to 100 MB/s , the possibilities are endless. Latest version of Mac OS® X 10.11 and later / Windows® 7 and later. Designed for Mac® and PC. USB 3.0 cable (USB 2.0 compatible ). LaCie Rugged Mini Overview. LaCie's 2TB Rugged USB 3.0 Type-C External Hard Drive is compatible with both Windows and Mac. Included is a USB 3.0 Type-C cable, a USB 3.0 Type-C to Type-A cable. The included USB 3.0 adapter works with Windows and Mac. Learn more aboutLaCie LAC9000633. The LaCie Rugged Mini Hard Disk shares features with our popular Rugged Hard Disk, like shock resistance, drop resistance, and a rubber sleeve for added protection. But with the Rugged Mini, we've gone a step further: it's also rain-resistant, and pressure-resistant-you can drive over it with a 1-ton car, and it still works! This hard drive is small, fast, and looks great. Great condition, fully functional, limited usage. The LaCie Rugged Mini Hard Disk shares features with our popular Rugged Hard Disk, like shock resistance, drop resistance, and a rubber sleeve for added protection. But with the Rugged Mini, we've gone a step further: it's also rain-resistant, and pressure-resistant-you can drive over it with a 1-ton car, and it still works! Your money back if you don't find these things upon receiving the external hard drive. Why buy anywhere else?. Lacie 2BIG Triple Interface 2-Disk, 4TBs External RAID Hard Drive - USED. Condition is Used. As photos indicate, the RAID hard drive is in excellent shape. Original 1TB hard drives have been replaced with 2-2TBs hard drives, for a total of 4TBs of useable drive space. This RAID supports RAID-1, RAID-5, JBOD, FAST and Safe100 RAID modes. Can mirror disk for a total of 2TBs, or use JBOD for a total of 4TBs of data space. Drive Array is in known good working order. Comes with USB2 and FW800 cables and AC power adapter. Your money back if you don't find these things upon receiving the external hard drive. Why buy anywhere else?. this IS FOR THE LACIE RUGGED USB-C. YOU CAN SEE THE PRICE LABEL ON ONE OF THE PICS. With its iconic orange design and data security, the Rugged has been one of LaCie's most popular hard drives. With the Rugged Mini drive, LaCie has reduced the size and added tons of new features, making it perfect for on-the-go data transport. 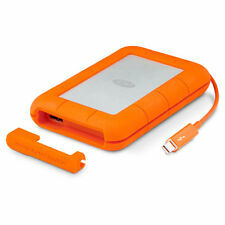 LaCie Rugged 500GB USB 3.0/FireWire 800 External Hard Drive. Condition is Used. Shipped with USPS Priority Mail. 4TB storage capacity. The LaCie desktop drive features a USB 3.0 interface for fast speeds plus a solid, aluminum casing that looks great. 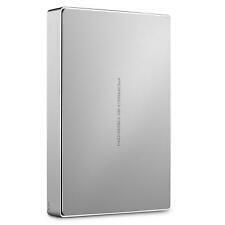 LaCie Porsche Design - hard drive. USB 3.0 cable. Expert Service. Lacie Rugged Raid Pro 4TB 250MB/s USB-C and USB 3.0. SD Card reader. Comes with 1-month membership for all Adobe Creative Cloud Apps. Condition is New. Shipped with USPS Priority Mail. Lacie 1 tb hard-drive in used but great working condition! Out of a collaboration born in 2003, a trailblazing tech firm and an iconic design house have forged another functional showpiece. Easy to operate. Porsche Design Form, LaCie Function. The all-aluminum enclosure is lightweight but also feels sturdy and substantial in your hands. 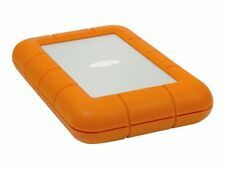 USED LaCie Rugged USB-C 4TB Portable Hard Drive. USB-C(Thunderbolt 3) cable included. No power cable needed Bus powered. We will take care of any problems that may arise. Lacie Quadra 2TB hdd USB 2.0 By Neil Poulton. Condition is New. Shipped with USPS Parcel Select Ground. 2TB Storage Capacity. Drop Resistant Up to 6.6'. Windows & Mac Compatible. IP54 Rated for Water & Dust. Crush Resistant up to 1 Ton. Product Highlights. Up for Sale is a LACIE 2TB EXTERNAL HD Model :D2 QUADRA V3. This is for one unit only 1 per price. 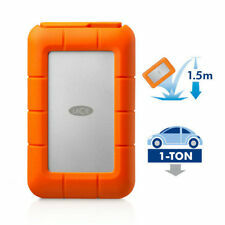 LaCie Rugged Mini 500GB External Hard Drive, 7200RPM USB 3.0, brand new. Condition is New. Shipped with USPS Priority Mail. LaCie 2tb Rugged Mini External Hard Drive USB 3.0 Model Stfr2000800. Condition is Used. Shipped with USPS Priority Mail. WORKING CONDITION. Item ID: S53805. NO OTHER PARTS OR ACCESSORIES INCLUDED. Best of all, it can achieve speeds up to 130 MB/s in USB 3.0. And, with its two-color front LED indicator, it is easy to check the drive status. Both products provide an ideal solution for a simple and user-friendly backup and file retrieval. Hi, For sale is a very lightly used (2 months) perfectly working 4TB Lacie Rugged Mini. It has USB 3.0 and comes with standard USB and USB C cables. It comes in the original box with all original paperwork and cables. If you have any questions feel free to ask. 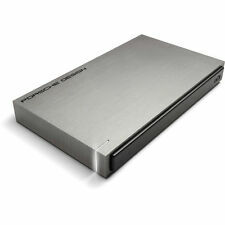 LaCie Porsche Design Desktop Drive. USB 3.0 cable (USB 2.0 compatible). Built for speed / Strong Aluminum casing. Tailor the LaCie Rugged to your precise needs. Leave it in RAID 0 (striped mode) to maximize speed and capacity. Or choose RAID 1 (mirrored mode), where your data is duplicated across the two drives. 5TB Lacie Rugged USB-C & USB 3.0 hard drive sealed in box. Condition is new. The LaCie Rugged Thunderbolt/USB-C (T/USB-C) hard drive is a dependable solution for on-the-go data access. Access your data wherever life takes you, with the LaCie Rugged Thunderbolt/USB-C external hard drive. 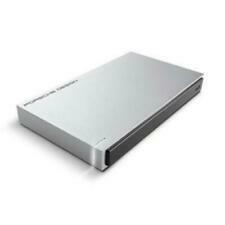 Lacie STEY8000401 2Big RAID Thunderbolt 2 8TB 7200RPM External Hard Drive. Condition is Barely Used. Shipped with USPS Priority Mail. 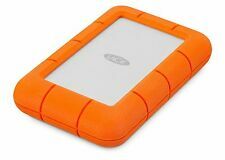 LaCie Rugged Hard Disk Triple 500 Gb USB 3.0 Firewire 800 Portable (K1). Condition is Used. Shipped with USPS Priority Mail. LaCie Rugged Triple Hard Disk USB 3.0 USB2.0 FireWire800 2TB, NEW!